My shroud has a neat cutout just under the top hose, you can see it highlited. Is that factory thing or an 'improvement' by the previous owner? I don't think it should be like that. That looks more like rub through than a deliberate modification. It's the same shroud for a 307, so a few people here should be able to confirm it. Is that only a 2nd type 327 engine Warren? I've never seen it on a 307 before, I'd have 3 or 4 shrouds in the shed without it. Too neat for a back yard job. I went to the Victorian State Monaro comp today, and had a look at the 20 or so HKs there. There were type 1 and type 2 cars. Some had reproduction shrouds, some had what looked like original shrouds and one (in concours) had a shroud which looked like it had been repaired in exactly that location. What you have there looks too good for an average bodge job, and too rough for a factory mod. I notice a crack starting to propagate from the cut out. Warren, was this a factory mod, or a running change by dealers? Yeah its starting to crack so I might strengthen it from the underside. Definately wasnt done by hand. A closer photo showing the machining marks. I asked Ben about this. What appears to have happened is the first dozen or so McKinnon 327 engine fitted GTS327's at each assembly plant were fitted with some "2nd type" parts but not all. These are cars built prior to GMH's nominated "break point" for 2nd type 327 engines which got all the nominated type 2 parts. Yours got the 2nd type radiator and they modified the 307 and 1st type 327 plastic shroud to fit it. Apparently for a short while the 2nd type engines had the 'glass shroud but for some reason GMH later reverted back to the plastic one with the cutout. Wayne, does your car have the proper neat alternator bracket or the one that is fabricated from pieces? 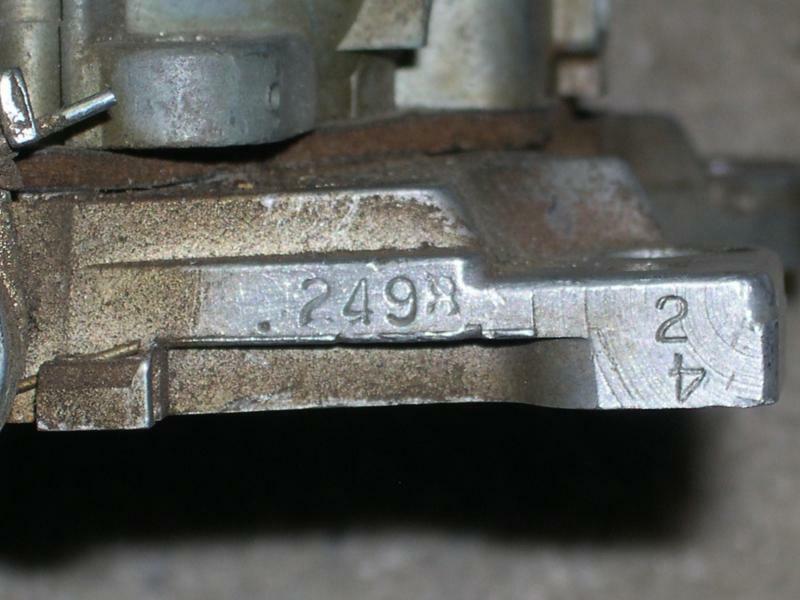 Does your engine have a Tonawanda inlet manifold (same cast number as a GTS350) and what is its date casting? It should have a 7029283 carby on it with no customer code or Julian date code nearby, but it should have an assembly date code on it on the throttle plate near to the rear mounting hole, stamped vertically. Not easy to see until you clean it. Cleaned up pretty good, well preserved under all that oil. Are you sure the manifold date code is 1108? Is it I108 or J108? It'd have to be I or J to get her in time to be fitted to your car! Tonawanda used I but I'm certain McKinnon didn't. The texta date code will probably be the right one, looks like 2098 which is July 27 1968. Not sure what to make of the 33Y with the fallen over 4. I have some 1968 model year Quadrajets at home and they have a normal code there like 3097 and this is normal for that timeframe. 33Y has me stumped. The date code is normally further forward, se the attached photo. Also Wayne, check your passenger side exhaust manifold. Your driver's side is a Tonawanda one (the big T gives it up). A McKinnon Industries example has a square with an M in it, some of the passenger side examples I have here have it next to the D. The water pump should have a McKinnon mark on it too. Cast dates on the engine and on the manifolds would be awesome if you get time to look for them whilst it is all out, engine is on the side of the block will look like 8K7 or close to it but spread out over about 6" with about 12mm font. Exhaust manifold cast dates are on the head side but you can see them. Very interesting. All good info as these 2nd type cars are virtually non-existant. Yours is further proof that the engines were very much a cobbled together effort for GMH by McKinnon Industries. Apart from this 2nd type GTS327 engine there appears to only be one other 8.5:1 4BL large journal 327 anywhere within GM, and that is in C20-C30 trucks, engine option L30. Not the same identical engine as these had forged crankshafts and valve rotators but the same basic thing. GM rated those at 240hp. ...it may make a bit of sense about the C20's and C30's having a similar engine to the HK 327 as I'm pretty sure they were marketed out here as well ?? Would they have been available in around that timeframe ? No. We basically only ever got 292 6cyl engines in C20-C60 and K20 trucks and only from 1975 to about 1980. The very last of these we got 350's in (around 1979) but only in C20 and C30 and only because emissions requirements were introduced during 1978 for trucks, and the 292's couldn't comply. The previous supply engine plant for HK 327 engines (Tonawanda) ceased 327 production at the end of 1968 GM model year production (model year is September-August, with production for the model year August-July). There was no passenger 4BBL 327 in 1969 model year, only the 210hp 327 (small 2BBL as per 307) and 235hp 327 (large 2BBL as per 1969 L65 350). Both of these 2BBL engines appear to wear 3927185 69cc heads for 9:1 compression. I'm not certain of their origins and who built them but I know Flint built some (possibly all) Impala 235hp 327 and logically McKinnon built the 210hp engines as small 2BBL engines is all they were building until sometime in 1969 calendar year. My guess is Tonawanda built no 327 engines after the start of July 1968. It makes sense then that McKinnon Industries supplied the last of the HK 327's completed in the latter part of 1968 (which we know they did), they'd simply have used the same bottom end from the 210hp engines (same cam, same pistons etc), and logically they imported the 4BBL intake from the nearest other plant (Tonawanda) as McKinnon were 6 months away from 4BBL engines. The only fly in this ointment is the 210hp 327 was dropped from Camaro and all other 1969 model Chevrolet and even Canadian GM vehicles by around October 1968 (replaced by 307). Exactly what else McKinnon were building that wore the 3927188 75cc heads is unclear - almost all 350's used 1.94/1.5 valves, and 307's used 69cc heads (they'd be about 8.25:1 with 75cc heads). The 188 heads aren't imported as they are McKinnon cast. There was one 350 2BBL C40-C50 truck engine in 1969 that used 1.72/1.5 valve heads, it was 8.0:1 with dished pistons and would have used 75cc heads, so it is possible the 188 heads belonged to these if McKinnon Industries built this engine. If so the 2nd type HK 327 engine is truly a mismatch of parts put together solely for GMH. As to the reason for the mismatched exhaust manifolds, the only reason will be is that McKinnon produced the LH one (their driver's side) for some application but the other side (our driver's side) was obviously no longer produced by them, so they had to get one from Tonawanda. Byron, what do you make of this cryptic comment in the early (yellow cover) HK parts book? I don't have the amendment. Does this refer to the odd manifold? I missed this 3 years ago Geoff! I think all they mean is that the RH manifold is the same for both 327 engines, and refer to parts book amendment. LH obviously changes between the two. I know a dude that we worked with that had I think it was a 1978 K20 and it had a big 292 6cyl in it and boy was it gutless as, they must of had all the USA pollution crap on it, my dad and him were traveling up to rocky and dad pulled up and asked what the hell are you doing plodding about like that and old mate said that he was flat too the boards, my dad's 1976 6cyl 250 powered F100 2wd would flog that 292 powered K20 4wd even the 350 powered ones were gutless crap as well.